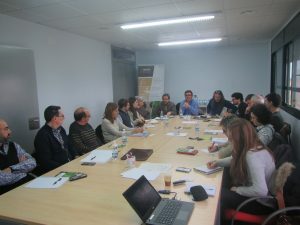 On February 2 took place in Amposta (Spain) the first Neurice meeting of 2018. The partners involved were Mar Català (IRTA, Amposta), Xavier Serrat (UB, Barcelona), Salvador Nogués (P1, UB) and Camilo Lopez (P1, UB). Català and Serrat were the organisers of the meeting. 22 people attended, 50% of them were part of the cientific community, 25% were part of the industry, and the last 25% were policy makers and authorities. The aim of the meeting was to describe in detail the Neurice project to policy makers, leaders of the rice industry and rice farmers of the rice affected area by apple snail in Spain. The main objective was to identify future needs for a new H2020 proposal for the snail eradication.